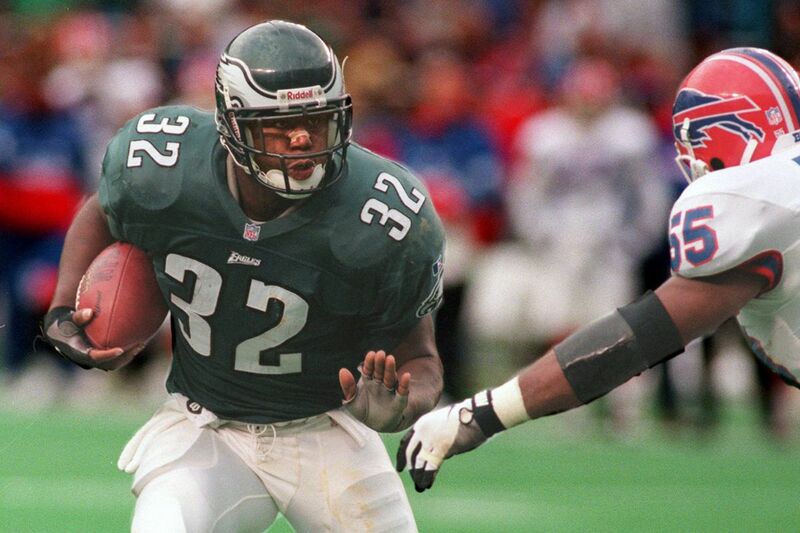 Ricky Watters (left) running the ball for the Eagles in 1996. Is he one of the quiz’s answers? 1. Who holds the single-game record for most touchdown passes in the Super Bowl? 2. Name the three players who caught Steve Young's six touchdown passes in Supe 29. Hint: Two were running backs. 3. Who holds the career record for most fumbles in Super Bowl play? 4. Which team won the only other Super Bowl played in Minneapolis? 5. Who holds the record for most receptions in a Super Bowl game? 1. Steve Young set the single-game record for most touchdowns passes in a Super Bowl with six in SB 29. 2. Jerry Rice (3), Ricky Watters (2) and William Floyd (1) combined to catch the six touchdown passes Steve Young threw in Super Bowl 29. 3. Roger Staubach holds the career record for most fumbles in Super Bowl play, with five in four games. 4. Washington won the only other Super Bowl played in Minneapolis. The Redskins beat Buffalo in Supe 26. 5. New England running back James White set the record for most receptions in a Super Bowl game, with 14 last year. The record for a non-overtime game is 13 by Demaryius Thomas in Supe 48.